Internet Security incorporates not only the technology needed to support a solid security strategy but also those policies and processes that must be incorporated in order for that strategy to work. New methods of breaking into corporate networks are resulting in major losses. This book provides the latest information on how to guard against attacks and informs the IT manager of the products that can detect and prevent break-ins. Crucial concepts such as authentication and encryption are explained, enabling the reader to understand when and where these technologies will be useful. Due to the authors' experiences in helping corporations develop secure networks, they are able to include the newest methods for protecting corporate data. Timothy Speed is an infrastructure and security architect for Lotus Professional Services (LPS), an IBM company. Tim has been involved in Internet and messaging security for the last 8 years. He has assisted with the Domino infrastructure at the Nagano Olympics and the Lotus Notes systems for the Sydney Olympics. Certifications include MCSE, VCA (VeriSign Certified Administrator), Lotus Domino CLP Principal Administrator, and Lotus Domino CLP Principal Developer. 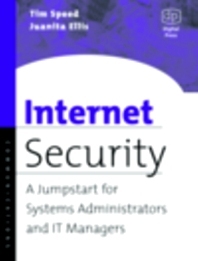 He and Juanita Ellis are the co-authors of books on Internet security and e-business. Lotus Consulting, Dallas, Texas, U.S.A.